The most ovarian cancer cases are diagnosed via emergency presentation – this means that the patient has presented to Accident and Emergency and a diagnosis has been made from there. Cervical screening does not detect ovarian cancer. There is currently no screening tool for ovarian cancer but Ovarian Cancer Action is trying to change that. Read more about our research into an ovarian cancer screening tool. One of the challenges of spotting ovarian cancer symptoms is that they are often mistaken for less serious conditions like Irritable Bowel Syndrome (IBS). Ovarian cancer is commonly treated with a combination of surgery (tumour resection) and chemotherapy. Radiotherapy is rarely used to treat the disease. People from backgrounds including Ashkenazi Jewish, Polish, Icelandic and Pakistani may be at greater risk of carrying a genetic mutation that increases ovarian cancer risk. 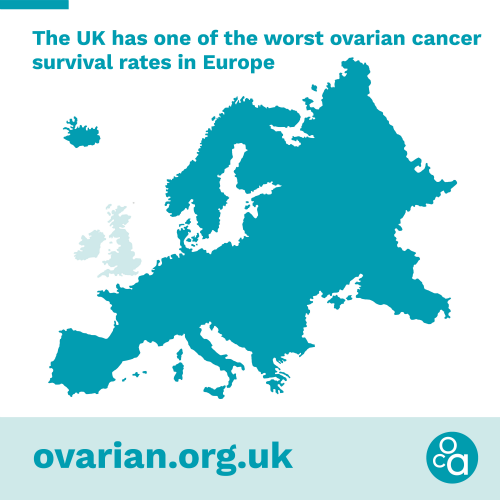 Ovarian Cancer Action is the UK’s ovarian cancer research charity and its mission is to fund research that saves lives. Every four years Ovarian Cancer Action curates and hosts The HHMT International Forum on Ovarian Cancer: a conference of international ovarian cancer experts. It brings together scientists across all disciplines to debate and determine the priorities in ovarian cancer research. These are published in the leading science journal Nature Reviews Cancer. These priorities inform our own research objectives.